The Vortex Viper once again dominates this year's report on binoculars, but we've also spotted some interesting new competition, including perennial rival Nikon and a upgrade option from Zeiss. Meanwhile, models from Celestron, Athlon, Leupold and Bushnell duke it out at the mid-range and value price points. Specs that Matter Exit pupil: 5.3 Eye relief: 18 mm Field of view: 409 ft. @ 1,000 yds. 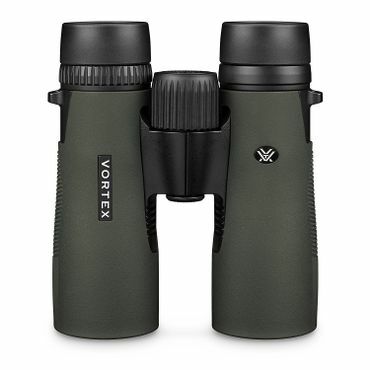 The Vortex Viper HD 8x42 binoculars provide the sort of clear, crisp, high-contract image you'd expect from $2,000 binoculars, but at a fraction of that price. They have high-density, extra-low dispersion glass, fully multicoated lenses and dielectric-coated roof prisms to gather more light. They're also waterproof and argon-purged to prevent lens fog, with an eyeglass-friendly eye relief of 18mm. The Viper performs exceptionally well in low-light conditions, and Vortex's lifetime "Very Important Promise" guarantee is exceptional. Specs that Matter Exit pupil: 5.3 mm Eye relief: 17 mm Field of view: 393 ft. @ 1,000 yds. When Vortex quietly redesigned its Diamondback 8x42 binoculars in 2016, they made a good product great, and it still reigns at the top of this category. Fully multicoated optics and a dielectric-coated roof prism deliver even clearer, crisper images than the previous model. Users say the adjustments are easy to make, the build quality draws many compliments, the rubberized coating feels sturdy in your hand, and the 5.3 mm exit pupil provides excellent low-light performance for this price range. Specs that Matter Exit pupil: 4.2 mm Eye relief: 18 mm Field of view: 340 ft. @ 1,000 yds. Hunters often have to endure tough terrain and bad weather. For them, the Bushnell Legend L Series Ultra HD 10x42 binoculars provide crisp, clear images thanks to ED glass and a custom lens coating, but it's still their durability that really shines. Users report freezing the Bushnell Legend L Series, dropping them off cliffs, and leaving them out in the rain -- and yet they keep on working. If you do manage to damage them, Bushnell offers an excellent lifetime guarantee. 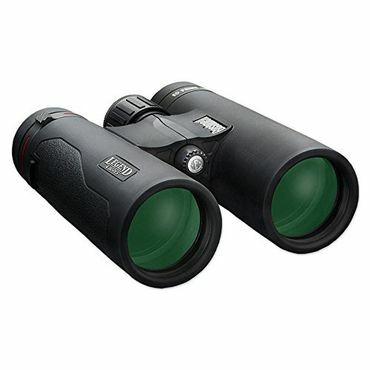 Even if you're not an avid birdwatcher, binoculars designed for birding offer great all-around performance for any pursuit. They prioritize clear, sharp images with a wide enough field of view to track a bird on the wing, in a package that's small and light enough to carry easily. Weatherproofing, fog-proofing and rubberized armor are all features that make it easy to hold and use your binoculars in any conditions you might encounter outdoors. Many birding binoculars work well for hunting, too; the sharp, accurate images they relay are just the trick for spotting a deer, turkey or other quarry hidden in the grass or bushes, or scanning distant hillsides for quarry. But determined hunters often find themselves traveling in rugged conditions that can destroy most binoculars, so in this category we place a premium on the ability to withstand repeated jostling, prolonged exposure to bad weather, and even full-on impacts. Although you won't get perfection in the sub-$200 price range, nowadays a couple of hundred dollars can buy you features like fully multicoated optics and dielectric coated roof prisms (which are lighter and more packable than porro prism binoculars). That said, when you're shopping in this price range you'll sacrifice some high-end aspects like low-light performance, ultra-wide fields of view, and crispness around the edges of the image. Build quality also suffers somewhat, although it's improved notably in recent years, and with careful treatment even inexpensive binoculars will last for years. Your binoculars' basic performance is decided by three factors: Magnification, the size of the objective lenses (the lenses furthest from your eyes, on the "front" of the binoculars), and lens quality. Every pair of binoculars is labeled with numbers that show the magnification and lens size, with magnification coming first. A set of 8x42 binoculars, for example, makes objects or animals appear eight times closer -- the first number -- and has an objective lens size of 42mm. If you're shopping for binoculars in person, "8x42" is pronounced "eight by forty-two." Magnification sizes typically run from 6x to 12x, although you'll sometimes find binoculars with magnification powers of 20x or more. The sweet spot for most uses is 8x magnification; it gives good detail, but doesn't magnify things so much that the normal movement of your hand produces a shaky image. Birders or hunters who have very steady hands or routinely use a tripod will sometimes go as high as 10x or 12x magnification to better spot soaring raptors or count points on a distant buck, but rarely more. The objective lens size tells you a lot about the size of the binoculars themselves. Full-size models usually have an objective lens size of around 40mm or 45mm, although some astronomers' sky-gazing binoculars come with whopping 56mm lenses. (These are the binoculars that often come in 16x or 20x magnification.) Higher magnifications and larger lenses make for more expensive binoculars, even within the same product line. Binoculars with an objective lens size of 25 mm or less are typically compact enough to fit in your pocket or a small pack; lenses of 30 mm to 35 mm are midsize, a good choice for someone who wants a space-saving model or for kids who can't handle a full-size set yet. Larger lenses usually make for a better field of view, which means you can see a wider part of the terrain without having to scan your binoculars back and forth. However, some of the best compact binoculars offer a field of view that's almost comparable to full-size models. The wider your field of view, the easier it'll be to spot -- and keep your eye on -- flying birds or fast-moving game. Manufacturers usually list field of view in the binoculars' specifications; the number they give represents the diameter of the area you can see (without scanning) from 1,000 yards out. Sometimes the manufacturer will list angle of view instead; in that case, multiply the angle by 52.5 to get the field of view. Magnification and objective lens diameter don't exist in a vacuum; the way they relate to each other tells you a lot about how your binoculars will perform, too. The exit pupil measurement, which you get by dividing objective lens size by magnification, gives you a pretty good gauge for how the binoculars will perform in low-light conditions. 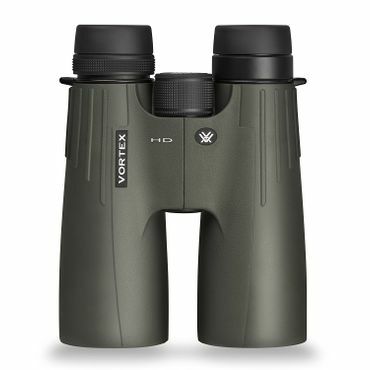 So, for our best-reviewed birding binoculars, the Vortex Viper HD 8x42 (Est. $500), for example, you would divide 42 mm by 8 to get an exit pupil of 5.25 mm, which is typically rounded up to 5.3. The larger the exit pupil number, the better the binoculars will do in low-light conditions. Experts say that binoculars with an exit pupil of 5 mm or more are good for use in low-light conditions like dawn, dusk, fog, or in shadow. If you know you'll only be using your binoculars for daylight viewing, any exit pupil of 2 mm or better is just fine. That's because your own pupils constrict to about 2 mm diameter in bright light so, regardless of how much light your binoculars gather, you won't be able to see any more than that until the light dims and your pupils dilate again. If you wear glasses in everyday life, you should wear them when you use your binoculars, too. However, your glasses move your eyes further away from the eyepiece of the binoculars, which can shrink your field of vision quite a bit. The solution is eye relief, a measurement of how far away the binoculars can be from your eyes before your field of vision starts to narrow. Experts say that if you wear eyeglasses or sunglasses, you should look for eye relief of at least 11 mm -- for many users, 15 mm or more is more comfortable. Ideally, the binoculars should also have adjustable eye cups that can be retracted (for use with glasses) or extended (for use with bare eyes). Users with deep-set eyes will usually prefer binoculars with greater eye relief, even if they don't wear glasses. Lens quality is a little harder to gauge, although the clarity and precision of your binoculars' lenses really is the ultimate arbiter of their performance. Price is typically a good indicator, and advances in optic technology mean you can now get top-notch performance -- or very close to it -- for less than $1,000. Key features that indicate good optics include fully multicoated lenses (which help the binoculars gather more light), ED or HD glass to do the same, and either dielectric coated roof prisms or high-quality porro prisms (which do not need to be coated). The best binoculars in all price ranges are also fully waterproof and nitrogen- or argon-purged (that is, filled with nitrogen or argon instead of air) to keep the lenses from fogging up. Once you have your binoculars, don't forget the other essentials you'll need to stay comfortable and safe while out on the trail. Protect your feet with a solid pair of hiking shoes, light up the night with the best and brightest headlamps, and use insect repellent to keep pests away. "Best Binoculars for Birding and Hiking of 2018"
"The Best Binoculars for Birds, Nature and the Outdoors"
"The 10 Best Binoculars of 2017"
The best binoculars offer clear, crisp images with enough magnification to be useful, plus waterproofing, anti-fogging technology, rubberized armor to protect against shocks, and a wide field of view. We consulted expert reviews from the Audubon Society, OutdoorGearLab.com, Field & Stream, TheWirecutter.com, OutdoorLife.com, Birdwatching.com and AllAboutBirds.com (the Cornell Lab for Ornithology) to help us gauge the objective merits of their performance, features, and especially their optics. However, even the best binoculars can have variable performance out in the field, so we also relied heavily on user feedback to discover which binoculars really represent the best value on the dollar, and how they perform when in the hands of someone who doesn't necessarily spend the majority of their life dealing with high-end optics. A magnification of 8x to 10x. A wide field of view. An exit pupil of at least 2 mm for day use, 5 mm or more for low light.